Today my students took their AP Literature test. The test started at 8 am downstairs in the school's tech atrium. Ten minutes before the test started, I bailed out of my first period junior class to check on my AP kids. I was afraid they'd be nervous or scared or lost or alone. You know, babies in the wilderness or something. I rushed down there, imagining all sorts of absurd possibilities, and there they all were, the whole freaking gang of nine of them, just sitting at their tables, waiting for the test to start. They looked strangely chipper for being about to embark on a 3 hour test that consists of 55 multiple choice questions and three essays. It broke my heart the way I imagine it would when a mom sends her boy off to college. All grown up now. Don't need their teacher anymore. "Any last words you have for them, Mrs. Larsen?" The counselor asked. Yes, actually, I thought. Tons. No matter what happens I'll always love you! But I didn't say any of that because none of that really means anything when you're staring a three hour test in the face. Instead I said, "I'm just so glad no one slept in." And I found my way back upstairs. All morning I thought about those kids. Teaching AP Lit this year has been an extremely rewarding and humbling experience. I did not feel at all prepared or qualified to teach it. 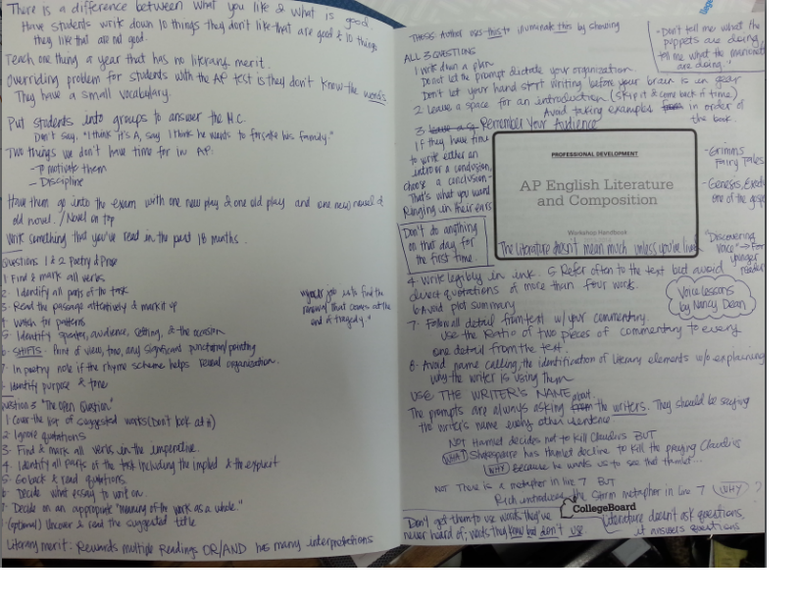 The AP Lit class at my school has always been small, and when I agreed to teach it last spring I had no idea what a struggling program it was. In August I looked at my roll and was shocked to see only eight kids in the class. During the course of the year we lost one kid and picked up two and by the time we arrived to today, May 8, we were nine. All nine of the kids in the class took the test. I don't know that all nine will pass. But they all took it. And that's something I'm extremely proud of. At an AP conference I went to in October the presenter said how important it is to encourage students to take the test, regardless of whether you think they will pass or not. He said that on a college application a student who has taken an AP class, and taken the test and failed it shows much more character and resilience than a student who took the class but never took the test. A student who failed the test shows tenacity, shows a willingness to fight, to see the thing through even in the face of failure. A student who takes the class but not the test shows someone who gave up. And that's why no matter if they pass or fail, I'm just so darn proud of them for going through with it. For paying the $92, for waking up early, for stressing all through March and April for their test and arriving here to May 8, to tackle the thing head on. I'm especially proud of my girl who gets so nervous on her practice essays that half the time she doesn't write them at all. I'm especially proud of my boy who took and failed two AP tests last year, but is here again this year, giving it another go. None of these kids come from very wealthy or privileged families and the fact that all nine of them were in there this morning, smiling and staring back at me almost made me want to just sit right there and cry. At about 11:45 the six girls poked their heads in. (The three boys, interestingly enough, had hightailed it out of the school. Can't say I blame them.) They said it was easier than they thought! Multiple choice was a piece of cake. They sailed through it. The essays were a breeze! I breathed a sigh of relief in that moment that I didn't know I had been keeping for the past four hours. I wanted to cry again. Gosh I just felt so stinkin proud of them. Manhandling that test like the true champions they are. We talked for about 20 minutes and they told me every single thing they could remember about the test before they begged me to let them go get some lunch already. They filed out and as they left I felt happy but also sad. So sad. Next year I am not teaching AP Literature. My school cut the class. There weren't enough students enrolled- 15 were signed up to take it and my principal said he needed at least 20-25 students per class to carry it for next year. When I asked him if I could go part time next year he said that the AP Lit class would likely be affected, that with less class periods being taught he would have to "trim the fat." AP Literature= fat. AP Lit competes with both AP Language and English 1010 for senior English credits, both classes that are taught by fabulous teachers. AP Lit just isn't strong enough to stand on its own two legs. I can't help feel a little bit like a failure for not being able to keep the AP Lit program running. I am passionate about literature and believe strongly in the power of the class- the power of stories, of novels, the study of people from all different cultures, times, places. But I couldn't keep it going. Colleges are giving less and less credit for AP Lit now as literature gets pushed out of states' curriculum for nonfiction reading and argumentative writing. I guess literature isn't practical enough. I understand but I don't understand too. Naturally I wonder if I weren't going part time if I would have been able to convince my principal to keep the class. If I could have saved it. If it was something I did wrong, some way that I didn't teach it good enough, that I didn't give enough, that I didn't try hard enough to recruit students to take the class for next year. It was hard to not feel guilty as I looked at my nine worn out AP students late this morning, tired, but so proud for their efforts. One girl said, "I heard you're not teaching this class next year? Why not?" I tried to explain it to them, and as I tried I realized that I didn't even really know except for schools get money and you can only do what money will let you. Plain and simple, not enough students signed up for the class. I had felt kind of okay about the death of AP Literature at my school until today. But when those girls came back up to tell me about the test and I could see the physical relief in their shoulders and the look of prideful accomplishment in their eyes, I knew I had to keep fighting for the class. I knew that it has value and worth and that it is important to offer at the school. I knew that I was capable of teaching it. It might not happen for next year, but gosh, I'm going to find a way to make sure that this is not a permanent death for AP Literature. As a student who took both AP Lit and AP Lang in high school (4-5 years ago) I say, keep fighting! I loved AP Lit with all my heart, even though it was ridiculously hard and made junior year hell. I feel like I gained SO much more from it than from AP Lang my senior year. And my AP score got me out of the awful Writing 150 at BYU! Added bonus. i was suppose to take AP English courses, but all my teachers just complained about how hard it was. I didn't think I'd be able to complete the class. Then the very next year in college English courses I thought it was so easy. I wish I had pushed myself. Also, I have experience with cutting classes because not enough signed up. My husband will be done with college classes in August. There was one class (required for his major) that is only offered spring term and fall semester. It needed 10 to carry and and only 2 had signed up. They had to drop it....we were upset--he'd have to stay another whole semester in the fall to take the ONE class. But, the department knew him and knew he was a senior and it was one of the last classes he needed, so they added a "Special Topics" class, which doesn't require a minimum of students that focuses on the same curriculum, so he and the one other student were able to sign up for that. Miracle. We feel very blessed! I have mixed feelings about AP classes (I know getting college credit is a financial benefit, but many student would benefit educationally from taking the classes at the college - and not b/c the HS is doing a poor job, just, you know, the more writing or math classes you take, the better you'll be! Especially writing. I would be in favor of doubling or tripling the amount of writing classes at most colleges...) But I am 100% on board with the rigorous curriculum involved with AP. I bet, whether the class is deemed AP or not, the student could be challenged at the same level (and technically students can take the test even if the class is not called "AP"). we didnt have that at my highschool but Literature was my favorite class in college. I saved all my essays because I like re-reading them :) I hope they bring it back! this brings back fond memories of my AP Lit class. The best HS class I ever took - also AP Calculus AB. Weird, I know. I loved both of them - just the level of it all, ya know? Nice job, lady. I"m so glad I took AP classes in college. And honestly, those were my favorite teachers. I never took AP Lit,but I took all the AP historys... such a great experience! Maybe you could suggest pairing AP Lit with AP US History? I believe they complement each other. I know the APUSH exam will ask a couple questions on literature written throughout the course, but because there is so much content that has to be covered, history teachers typically don't have time to incorporate novels. Plus, both are typically junior level courses, so scheduling wouldn't be too difficult. I think it could be a win-win for both programs. AP Lit was definitely my favorite class I ever took. At my school it was the opposite, we had a lit class but not a language class. I took both the lit and language test and I personally think the lit class was much more beneficial for me in college than the language one would have been. So keep fighting! Oh what a sweet post Bonnie. I'm sure it's hard for you to see something you gave so much to this year go by the wayside because you've decided to go part time. For what it's worth, don't worry too much about it. There's a time and season to all things in life. You can't be everything to everyone, and now being a mother who is there for her child is most important. Way to go teaching an AP class though! That alone is a huge accomplishment! I bet most of your students passed! Awesome job Bonnie.